Karl Lagerfeld’s creativity is jaw dropping. 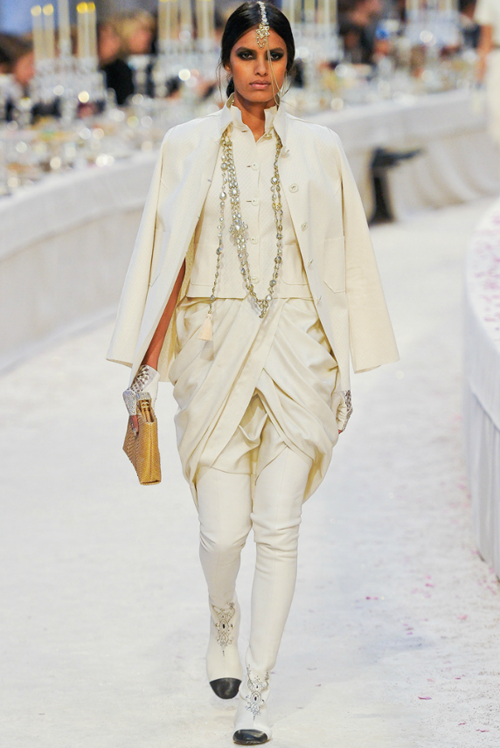 It was no surprise that the Chanel Pre-Fall 2012 collection was anything but spectacular. The concept? A Chanel Empire where Bombay meets Paris for the ultimate decadence. Model after model walked the runway in trademark tweeds, ivory silk and white leather. White leather has been on the Donna Ida radar for a while now. With the J Brand 901 Leathers set to arrive in 2012 we will definitely be styling them with minimalistic tunics, silk blouses and monochrome styles à la Chanel. For more information on the J Brand 901 Leathers in White or to join the waiting list contact customercare@donnaida.com.